Driving on Mountain View Road, with Mount Rainier towering above us, we squinted at a group of brown, hairy mammals resting a half-mile away in a valley. We assumed they were alpacas. After all, we were on a scenic drive near Enumclaw, a small town in the shadow of Mount Rainier. Wouldn't livestock be the main four-legged residents of this area? After driving a bit closer, we realized that we were viewing a magnificent herd of wild elk, with some bulls surpassing the 600-pound mark and sporting 10-point racks. What an awesome bonus to the semi-rural day trip we had anticipated — and we couldn’t have been happier. Increasingly, this corner of South King County is attracting day trippers and travelers interested in outdoor adventures, ecotourism and even a foodie experience or two, plus popular Pacific Northwest Scottish Highland Games taking place July 27–29, 2018. Once considered a pleasant stopover to buy groceries prior to a weekend trip to Mount Rainier, Enumclaw offers plenty of reasons to make this a standalone destination. Here are not-to-miss summer adventures for families around Enumclaw. Over the past decade, the Pacific Northwest Scottish Highland Games and Clan Gathering, known informally as the Highland Games, have transformed from a small single-day athletic competition to a weekend-long event featuring a wide range of Scottish heritage competitions and activities. The games take place at the Enumclaw Expo Center (formerly the King County Fairgrounds) Friday–Sunday, July 27–29, 2018. Watch Scottish athletic events such as the caber toss and sheaf toss; watch the precision and showmanship of smartly-dressed pipe and drum bands; taste some haggis (if you dare) or bangers and mash; and see examples of Scottish crafts. Volunteers oversee children's athletic events each day at the Isle O' The Wee Bairns. Note: Tickets are $15–$20 for a one-day pass; kids 5 and under are free; weekend passes available. No clan affiliation is required to make this a fun, interactive, educational outing. Editor's note: On July 23, 2018, the wading pool at Mud Mountain Dam was closed for repairs but may be fixed soon. Be sure to call before heading out to confirm it's open: (360) 825-3211. To work off summer wiggles, head to Mud Mountain Dam (on Highway 410), a recreational area located about eight miles southeast of Enumclaw. You'll find trails, grassy fields, picnic tables and shelters with grills. 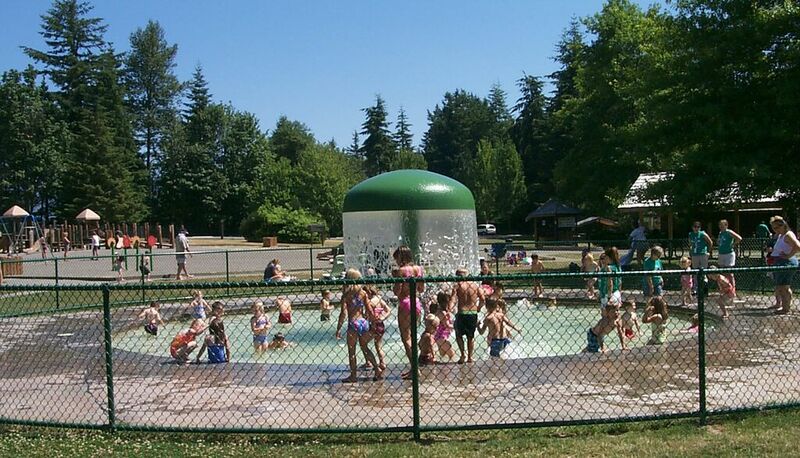 Kids will enjoy climbing on the two play structures and — open in the summer — splashing in the wading pool. Hike the short trail to view the dam, a 1948 WPA project on the White River; according to VisitRainier.com, the dam was the largest of its kind in the world when it was created. Nolte State Park, about six miles north of Enumclaw (36921 Veazie Cumberland Road S.E. ), offers swimming and fishing opportunities as well as a scenic, kid-friendly 1.4 mile loop trail around Deep Lake, the heart of the park. Children's play equipment, covered picnic shelters, barbecues and geocaches are also located inside the park. Search out Sweet Necessities (1215 Griffin Ave.), best known for its fabulous ice cream, owner Toby Wenham’s caramels and chocolates from Northwest chocolatiers when you're in need of a sweet treat. The shop carries frozen goodness from Snoqualmie Gourmet Ice Cream — consider topping it with a signature salted caramel sauce. Other popular items for sale include jams, scone mixes, pepper jellies, wines and approximately 100 varieties of loose tea, including black, green, white and oolong. Hungry families can venture to Kelly’s Restaurant and Lounge (1444 Cole Street), a restaurant with an eclectic menu ranging from Crab & Beet Salad to Chicken Bacon Pot Pie. Proprietor Kelly Bauer is happy to offer several kid-friendly entrées, such as mac and Kelly's Burger. Her philosophy is that children should not be relegated to a kids’ menu, and that they will enjoy sampling quality entrées. At The Historic Mint Alehouse (1608 Cole Street), grown-ups can sample a few of the 25 beers on tap or try a hand-crafted cocktails. Kids are welcome, too, and will enjoy ordering from the kids' menu; kids' meals are served on Frisbees (!). Play at Crystal Mountain which offers gondola rides, wildflowers and much more summer fun, and it's just another 50 minutes down 410 from Enumclaw. Hike to ghost towns in the area around Enumclaw and Black Diamond, once a center for coal mining. Explore the region's mining history at the Black Diamond museum, then hike around Franklin, a former coal-boom town. Editor's note: This article was originally published in 2015 and updated in July 2018. Sarah Wyatt is a travel and entertainment writer with work appearing in the Associated Press, Costco Connection, Alaska Airlines magazine, AARP and The Seattle Times.